In my last post I discussed the Virginia earthquake that shook eastern North America on August 23rd, 2011. Here is the second part of that story: unfortunately the answer to the question I pose in the title is not particularly satisfactory. We cannot answer the question about whose fault is it (or more precisely which fault was it?) because the quake occurred along a buried and previously unrecognized fault in the Virginia Piedmont. Simply put, rocks in central Virginia are under stress, and on August 23rd, 2011 the stress level exceeded the local rock strength and a previously unknown fault ruptured. The maximum compressive stress that produced the earthquake was likely oriented west-northwest/east-southeast. What is the cause of that stress? Virginia lies astride eastern North America’s passive margin and is thousands of kilometers from active tectonic boundaries. The vast majority of the world’s earthquakes occur at or very near tectonic plate boundaries. The causal mechanism for the Virginia quake is not clear. As Seth Stein at Northwestern University puts it, parts of eastern North America may be better described as a “passive-aggressive” margin. We all know that passive-aggressive types are difficult to deal with and sometimes hard to understand—the Virginia Piedmont is similar. There is much left to learn about these intraplate earthquakes. 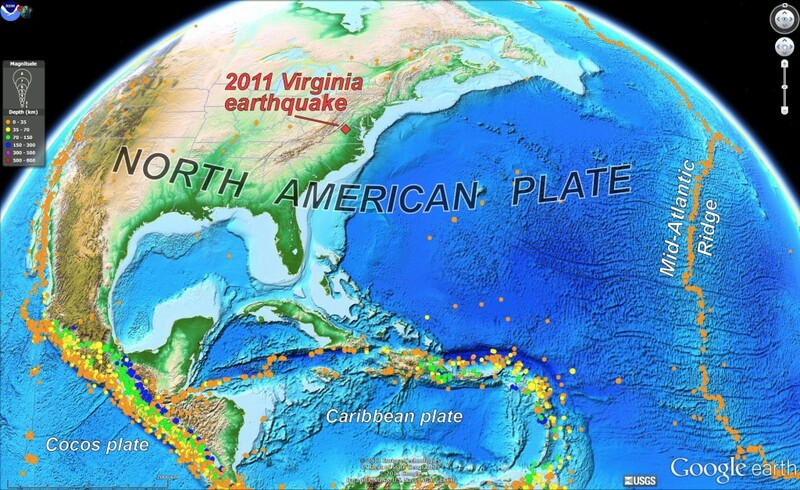 The 2011 Virginia earthquake occurred well within the North American plate. Colored dots represent earthquakes of M>5 and cluster along plate boundaries. Earthquake data from National Earthquake Information Center (1973-2011). In the days after the August quake some postulated that fracking operations may have been responsible for the Virginia earthquake. Hydraulic fracturing, or fracking, is a process by which fluids are pumped into a well and pressurized until the surrounding bedrock, at a specified depth, is fractured. 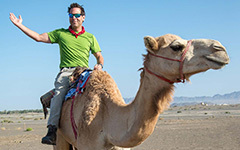 By increasing the fluid pressure, the effective stress on the subsurface rocks is reduced (in essence the pressurized fluid “pushes back” on the natural stresses generated from the overlying and surrounding rocks). When the effective stress exceeds the tensile strength of the rock, fracturing occurs. Hydraulic fracturing is being used to greatly increase the permeability of subsurface formations in the Appalachian basin to aid natural gas extraction. Many thousands of gas wells have been drilled in Pennsylvania, West Virginia, and Ohio over the past five years and the region has experienced nothing less than an energy boom. Pumping fluids into the subsurface has triggered earthquakes (e.g. the Rocky Mountain Arsenal in the 1960s, the Rangely, Colorado oilfield between 1969-1973; the Basel, Switzerland geothermal field in 2006, to name a few), but these earthquakes are proximal to the injection sites (<10 km). Many localities where fracking and/or fluid injection into wells is occurring are rightly concerned about the prospect of seismic activity. Topography and geologic provinces of the mid-Atlantic region, eastern United States. This is not the case in the central Virginia Piedmont as the nearest hydraulically fractured gas wells are nearly 200 kilometers away in West Virginia. 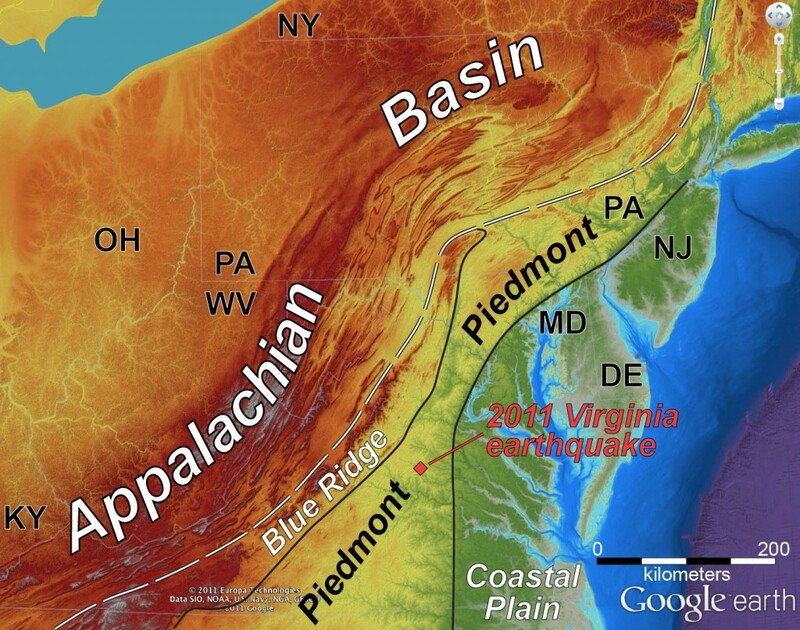 Most hydraulic fracturing in the Appalachian basin occurs at depths of 1,000 to 2,000 meters (~4,000 to 8,000 feet); the hypocenter for the Virginia quake was considerably deeper, between 4 and 5 km depth (2.5 to 3 miles). The subsurface geology between the Appalachian basin (layered sedimentary formations) and the Virginia Piedmont (complexly deformed metamorphic rocks) is strikingly dissimilar as well. Let’s be clear, hydraulic fracturing was not responsible for the 2011 Virginia earthquake. While the August temblor was larger than any previously recorded in the region, this quake was nothing unusual as a number of Virginia faults have slipped in the recent geologic past (remember, however, that recent for a geologist can be a million years or so). 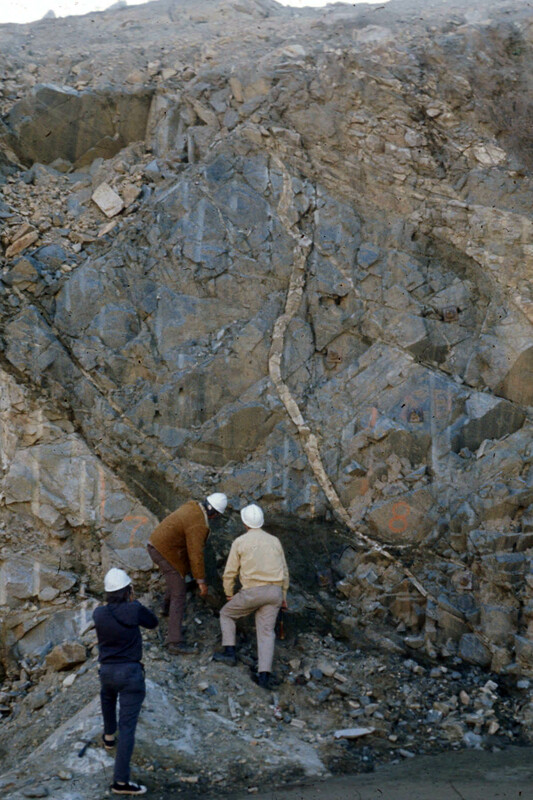 In my early years as a W&M faculty member, I worked on a project with my colleague Rick Berquist (Virginia Division of Geology and Mineral Resources) in which we examined reverse faults in the eastern Piedmont that juxtapose old igneous rocks over Neogene marine sediments. The earthquakes that caused these faults to slip occurred in the last few million years and the rupture occurred pretty much at the Earth’s surface. Although they seem novel to us, earthquakes are nothing new in Virginia. 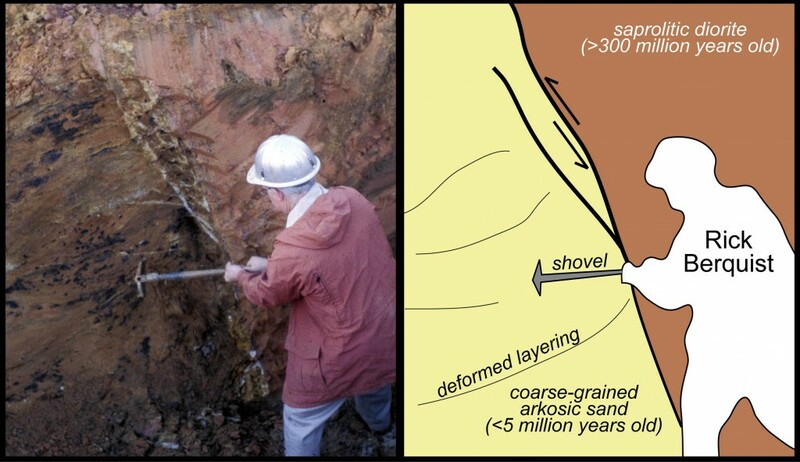 Field photograph (left) and annotated sketch (right) of reverse fault and Rick Berquist wielding a mean shovel at the Old Hickory mine, south side Virginia. Fault places Paleozoic igneous rocks on Neogene Coastal Plain strata. The shaking from the 2011 Virginia earthquake was vigorous and the nuclear reactors at the North Anna Power Station automatically shut down. Strong motion accelerometers at the North Anna site recorded peak accelerations of 2.6 m/sec2. The Earth’s gravity accelerates objects at about 9.8 m/sec2 (32 ft/sec2), so jolts from the Virginia quake accelerated the ground at just over 25% of Earth’s gravity (g). These values need to be put into perspective; most people think only of acceleration in terms of how fast an automobile ramps up its speed when the accelerator pedal is crushed. Consider a muscle car that rushes from 0 to 60 mph in 5 seconds- that’s an acceleration of 18 ft/sec2 (just 2/3s of a g) but more than sufficient to push you back in your seat. The ground acceleration coupled with the high frequency of the shaking from the Virginia quake was significant and conspired to do plenty of damage in Louisa County. Part of the concern is that the shaking at the North Anna Power Station exceeded its original design value. I went back and examined the reports prepared by engineering firms for Vepco (the forerunner of Dominion, the power company that runs the North Anna facility) back in 1969 and 1971. In the section on Operating Basis Earthquake they write “On the basis of the seismic history of the area, it does not appear likely that the site would be subjected to ground motions above Intensity V during the life of the proposed facility.” As I noted in the previous post, the shaking experienced in central Virginia from the 2011 quake reached Intensity VII to VIII. Oops! The report also states, “that the maximum horizontal ground acceleration… at the site due to such a shock would be no more than 12% of gravity”. The 2011 event exceeded that by a factor of two, but by all accounts the facility endured the shaking with relatively modest damage and the safety systems and procedures worked as designed. Although there were problems with the first seismic evaluation, we should be mindful that the report was written prior to the modern seismological network that has characterized the Central Virginia seismic zone over the past three decades. Geologists examining structures in the excavation at the North Anna Power Station in the early 1970’s. Photo by Steve Clement. Geologic map of the North Anna Power Station. Redrafted from the Dames & Moore report (August, 1973). Symbols with numbers are the orientation of foliation. 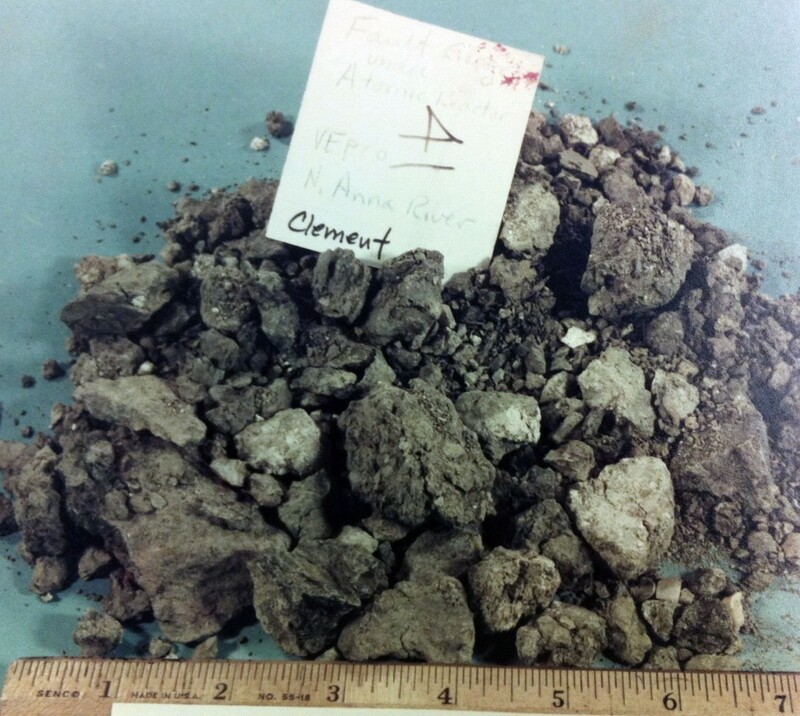 In 1970, William & Mary Geology professors Steve Clement and Bruce Goodwin along with John Tyler Community College professor John Funkhouser visited the site and recognized a fault cutting through the bedrock in the excavations. 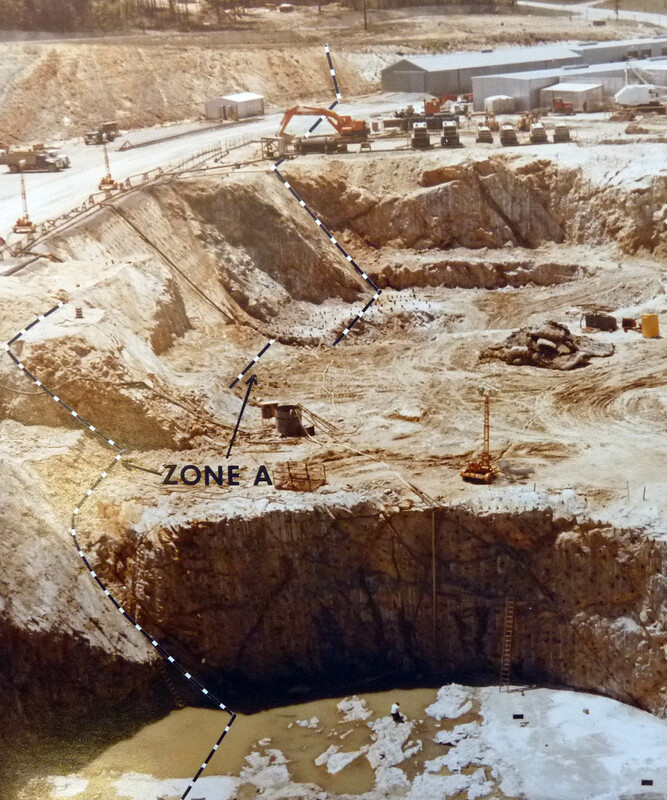 At the North Anna site four approximately circular holes were excavated for the reactor foundations (although only two reactors were constructed), each hole was about 40 m (125 ft) in diameter and the total distance between the excavations from unit 1 to unit 4 was ~300 m (1000 ft). The fault, a east-northeast striking structure dipping 40˚ to 50˚ to the north, cut through all four excavations. Go figure. The geological consultants hired to evaluate the site either never recognized the fault or chose not to disclose its presence. The original site assessment glossed over salient geological structures. Vepco’s Final Safety Analysis Report (from March 1973) stated “Faulting at the site is neither known nor is it suspected: all available information tends to confirm the continuity of the strata”. Commenting on their 1970 visit (which occurred 3 years prior to the Final Safety Analysis Report) Steve Clement noted that “the fault was a classic example that I’d expect most undergraduate students to recognize” and Bruce Goodwin said of a Vepco representative “he’d have to have been asleep not to know there was a fault”. They really did not want to call it a fault. But a fault is what it is. Nobody wants a fault under a nuclear power plant. Oblique aerial view to the west-southwest of unit 3 and 4 excavation. Zone A is a north-dipping brittle fault. Note person in at the base of Unit 3 excavation for scale. Photo from Dames & Moore report (August, 1973). The discussion now focused on whether the fault was a seismically capable structure. The Nuclear Regulatory Commission defines a capable fault as one that has experienced movement at or near the ground surface at least once within the past 35,000 years or movement of a recurring nature within the past 500,000 years or as a fault with instrumentally determined seismicity associated with it. Determining the capability of a fault is not necessarily easy. 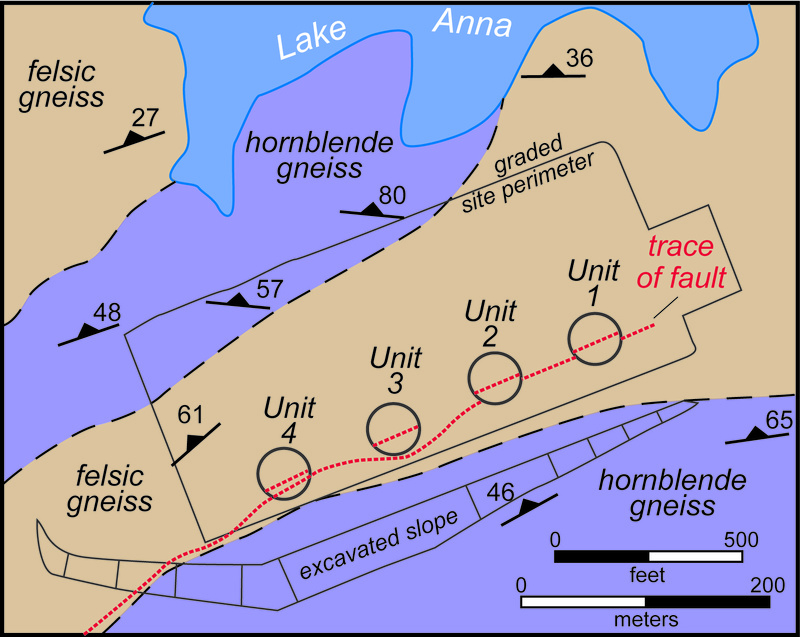 The supplemental Dames & Moore report is extensive and they employed an array of techniques to determine the age of faulting. 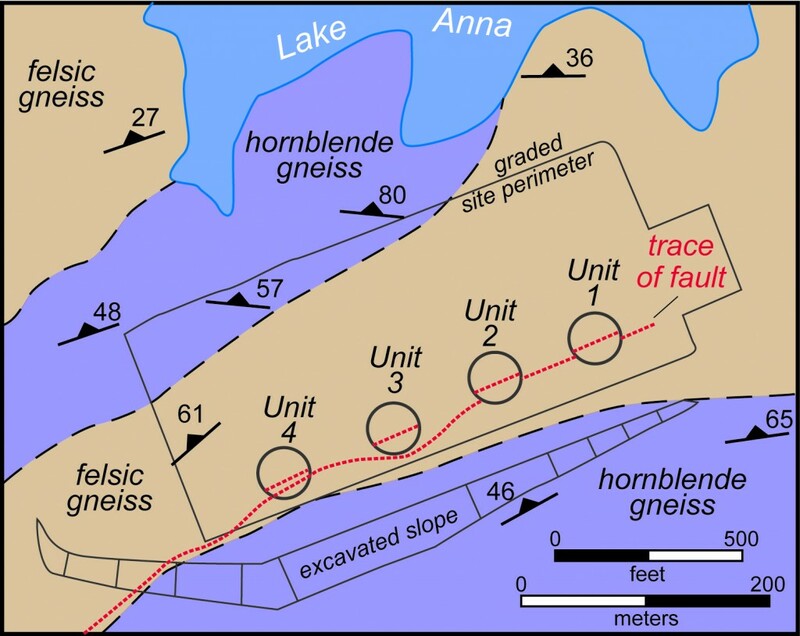 Their conclusion, which was supported by a number of geologists with no vested interest in the power station, was that the fault was a minor normal fault that had reactivated an older reverse fault and that the last motion on the structure occurred ~200 million years ago. These findings were in lock-step with the 1970s-era understanding of eastern North America’s geologic history. The power station (Units 1 and 2) was built and Vepco did pay a modest fine for making false statements. Fault gouge from the excavations at the North Anna Power Station. Photo by Steve Clement. Nearly forty years on and one moderate earthquake later what can be concluded of the fault under the North Anna Power Station? My conclusions are based on evaluating the existing reports, maps, and photos of the site. It would be glorious to study the exposures present in the early 1970s when the site was excavated and exposed. Today, there are more and better techniques for evaluating slip on faults as well as determining when those faults last slipped. Perhaps, the jolt from 2011 Virginia earthquake was sufficient for geologists to abandon some long-held assumptions about the passive character of eastern North America and reexamine the region anew. You should have that gouge analyzed using Ar/Ar! There are a few labs doing that now with the goal of constraining fault slip age. It would be a fun little project. Is the fault concordant with regional foliation?–looks from the map and image like it might be. Is it entirely within the felsic unit. I would also think about differential weathering of a thin mafic layer to produce the “gouge”. No fault striae are mentioned.